You have to create a facebook application. It will provide application_id and application_secret. 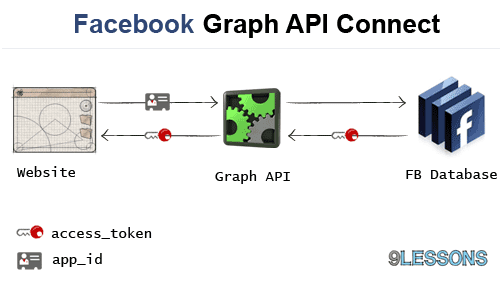 While clicking Add Facebook anchor tag URL requesting Facebook Graph API with contains your web project redirection URL. Redirecting file contains PHP code. Here you have to include facebook.php (Facebook library file) to getting the access token values. Updating users table where username=$user_session (login user). Continue....: Next part Status Message Update. Since in the mysql_query makes an UPDATE to something that does not get inserted and tries to update facebook_uid but this does not exist (UID). I am trying to print $user_session but his content is null ¿any idea? Greetings. Very Good Post.... Keep Posting..
yo, none of this matches up with your demo. or if it does, you're not providing some pieces. i was just trying out your oauth twitter demo and it was the same thing. whats up with that? Brian Urban I am facing same problem. can any one post solution for that. Eg: 1194063517_106077952801531 storing like this. But, what about the issues that Mark .Z will turn off facebook next March until forever? Does the facebook API which we use already would be a waste? I just wonder why you store access_token in database ? Very important script you have shared really I have need of it. thanks for this great script, i am trying, but dont know why it cant save data into database, but i am trying to solve, hope it will work. Will it works on localhost? I did not get your point can you explain more about the problem. Hello Tamada why you save in db isn't it ok to store then session. is this use in latter use. can't the Java to render the facebook News Feed. I have DB connection but is shows no Java. where is the query that insert into users table? how can we update without insert it first..
2. why is it not possible in locahost?...i ve added to the facebook application settings , siteURL as http://localhost....won't that work?? I would really like to get a zip or something to download. I copied your files, created App in facebook, modified all configurations, now home.php shows blanck, and $facebook_uid is always empty. Also where are you inserting row into the database ? All I see is an update statement no insert anywhere. Please help me clarify these points. What was the exact problem in download script, let me know I will modify. can you please help me to solve my problem? Why cant we download the files? You only let us get facebook.php which we could get right from their site. Srinivas I'm trouble it's now allowing me to add facebook. It's just loading into the same home.php page. As many others have pointed out, this code does not INSERT into the database, so, this code does nothing. "message": "An unknown error has occurred." How can this be made so the facebook login pops up and redirects back to the page. and when i m executing after redirection i will get an empty session plz help me. Hi.. where I can find this? Hey Srinivas, i guess fb has changed something on their side, $session = $facebook->getSession(); is returning null. Any work around you can suggest? Thanks avinash! Since we are UPDATING the 'users' table, which is initially blank for me,i'm not able to update any records, hence nothing is saved anytime. Could you suggest some improvements that i can implement so as to insert new rows ? plz suggest how to fix this session thing. The $session is always NULL. Plz help. Great to hear from you. I feel interesting to read your blog. Its really informative too..
how to access the likes and comments from a facebook webpage and store it in a database..!!! This is my code.I have to store the uid,name and access token of the user into my database. Please help me out.I am just a college student,so I am not that aware of coding and techniques.So please reply me soon. By default in database there is no value to update what can i update through the update query with inserting any row.